Our beautiful silver anklets are hand made by some of the best craftsmen of India. 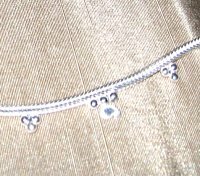 All our silver anklets are made from sterling silver of very high purity. You really need to wear one of our anklets to appreciate its fine quality and the superior craftsmanship.